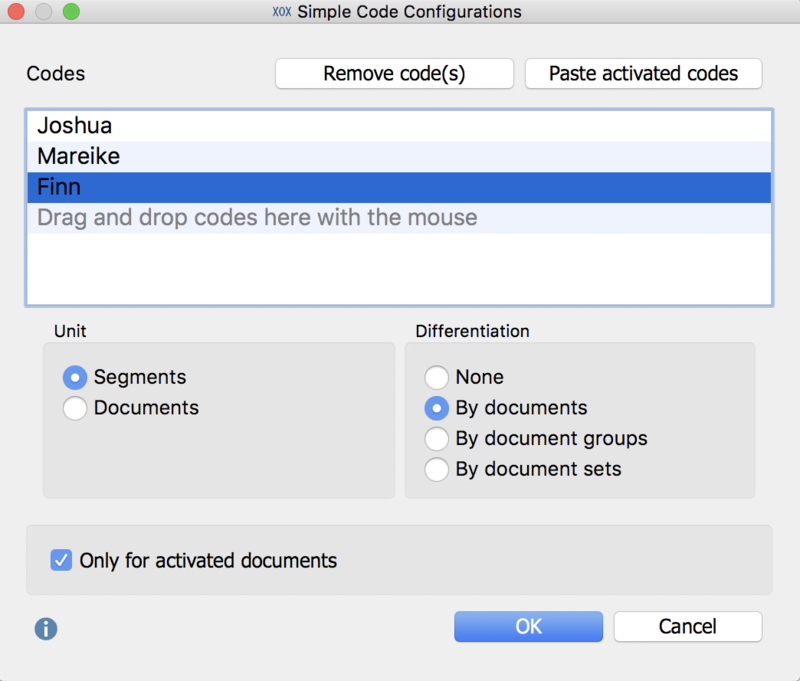 Code configurations enable you to examine the co-occurrence of codes in a document or segment; They are particularly suitable for analyzing code combinations. Code configurations can effectively support a multi-dimensional analysis as well as the formation of types through identifying patterns. Selected codes form the columns and the combination of these codes are marked with a symbol (here an “x“). In the last column, you can see in how many segments the combination occurs. For example, you can see in the first row of the table that the game between Finn and Mareike occurs in 5 segments. The remaining rows reveal that it never occurred that all three children played together as a group, since there is no row with an x for each row. The number of documents can also be displayed in lieu of the number of segments. The columns contain the parent codes, i.e. the analyzed dimensions. The cells contain the subcodes, i.e. the manifestations of each individual dimensions. In the last column, MAXQDA displays in how many segments of your data material the three subcodes of each respective row co-occurred. So, in the first line, you can see that a ball game between Ms. Mathilde and Finn occurred in 10 situations. To perform a simple analysis of code configurations, select the following function: Analysis > Code Configurations > Simple Code Configurations. A dialog window will appear into which you can drag-and-drop codes from the “Code System” with your mouse. Alternatively, the activated codes can be transferred to the selection window by clicking the Add activated codes button. The Remove code(s) button can be used to remove selected codes from the selection window again. Units – Selecting the unit “Segments” analyzes in how many segments within your data these codes co-occur. By selecting “Documents”, it doesn’t matter where the codes occur in your documents; what is important is that the code occurred in the documents at all. With the unit “Documents”, it is irrelevant if the code occurs multiple times in a given document – one occurrence is sufficient to be counted. Differentiation – Here, you determine whether the results table should be divided into documents, document groups, or document groups. This allows easy comparison of cases or groups of cases. If you selected “Documents” as your unit, you cannot select a breakdown by document. Selecting the option Only activated codes, restricts the analysis to activated documents. The first columns of the results table are headed with the names of the selected codes and provide information on the occurrence of the respective codes. If the code occurs on a segment, a blue square is shown in the column. Each line contains a different combination (or “configuration”) of the analyzed codes. In the upper right corner of the window, you will find information on how many combinations actually occurred in the evaluated documents and – behind them in brackets – how many could maximally have occurred. Please note: If a combination of codes does not exist, this row will not be listed in the table. Only the segments with at least one of the selected codes have been analyzed. So, when the unit “Segments” is selected, rows that do not contain any of the evaluated codes will not be displayed. The “Segments” column indicates the number of times a particular combination occurs in the documents analyzed. The “Percent” column contains the corresponding relative frequency. The second row in the table above shows that Finn and Mareike have played together in 5 situations (corresponding to 25% of the analyzed segments). The “Number of codes” column displays how many codes occur in that combination. As the table above never displays 3 in this column, one can conclude that no situation has been observed in which all 3 children played together. If you selected a differentiation for documents, document groups or document sets, additional columns are added for each selected unit at the end of the table – in the example above for the two documents “Day 1” and “Day 2”. The display in the columns can be switched between absolute numbers and row or column percentages with the three symbols in the toolbar. In the above table, the column percentages are selected so that the results for the individual documents can be directly compared with the values in the “Percent” column. (1) In the results table, the column headed “Segments” with corresponding to the numbered unit is instead headed “Documents”. It specifies how many analyzed documents contain the respective combination of codes. (2) If there are documents that do not contain any of the analyzed codes, the results table will contain a row without blue squares. (3) A “Detailed View” table is also displayed in which you can see which combination of the selected codes is contained within each document. The table basically corresponds to the “Code Matrix Browser” visual tool, with interchanged rows and columns. To perform a complex code configuration, select the following function: Analysis > Code Configurations > Complex Code Configurations. A dialog window will appear, into which you can drag-and-drop parent codes from the “Code System“ with your mouse. MAXQDA then automatically lists their respective subcodes from which you can exclude individual subcodes from the analysis by unchecking their selection box. The settings in this dialog window are the same as described above for the simple code configurations. The first columns contain of your selected parent codes. Each line contains a combination of the subcodes, and the “Segments” column tells you how often these combinations occur in your data. For example, from the first line of the above table, you can see that Ms Berkempers plays the game of a “knight’s castle” with Joshua seven times. This accounts for nearly 26% of all your coded observations. At the right side of the table, MAXQDA will display columns containing frequencies in the individual documents, document groups, or document sets, if you selected to analyze them. The values in these additional columns can be switched to column percentages or line percentages. Statistics – displays the results as a frequency table. This frequency table can also be switched to a chart to visually display the results. Number – the additional columns with documents, document groups or document sets will display their absolute numbers. Row percentages – the additional columns with documents, document groups or document sets will display their row percentages. Column percentages – the additional columns with documents, document groups or document sets will display their column percentages. The code configuration tables are arranged according to combination frequencies – by clicking on a column header, this arrangement can be adjusted. The order of the table’s columns can be changed by clicking and dragging the header with the mouse. 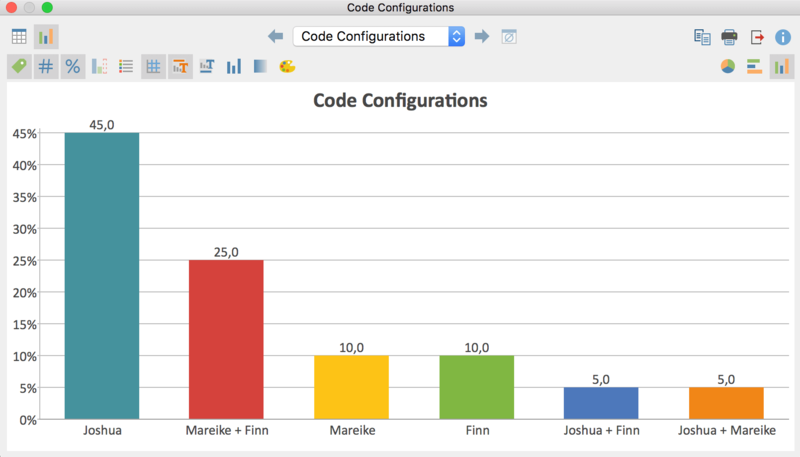 Tip: The result tables of the simple and complex code configurations are interactive. A double-click on a line with a code combination lists all associated coded segments in your “Retrieved Segments” window. The current display can be exported using the usual icons at the top right of the window. The selected rows are always exported – if no rows are selected, the entire table is exported. A click on the chart symbol on the top left will display the current table as a horizontal or vertical bar chart or as a pie chart. 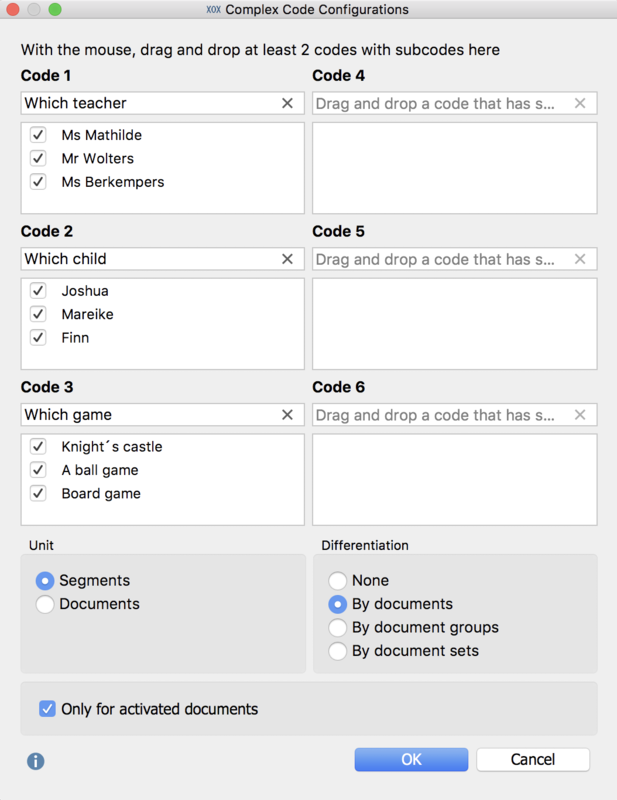 If you selected “Documents” as your unit, you will see in the row, the number of analyzed documents in which none of the respective codes occur. Refer to the section Frequency Tables and Charts for Subcodes for information on creating and customizing charts.